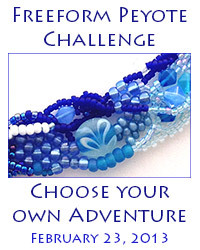 I'm so happy today to be able to post photos of two new bracelets, made for the Choose Your Own Adventure blog hop hosted by Mandi Ainsworth and Karen Williams. The idea behind the blog hop was to create something in freeform peyote stitch, which is one of my favorite techniques. I thought it was an awesome idea, not only for people like me who already adore freeform, but for those who would like to try it out for size. I am really enjoying being part of their Facebook group as well, and highly recommend stopping by if you're of a mind to try out some freeform yourself; they have some wonderful ideas and tips in the posts. I tried something new with this first one. I used leftover bead soup from my Honeybutter necklace (made years ago in freeform right angle weave) and have named it Honeycomb. Instead of starting off with one strip of peyote and working off of that strip continuously, I made several strips and then wove them together with more freeform. When I start with a single strip, the edges tend to have scallops from connecting new lines of peyote to the original strip, and I wanted to see how it would lie if you didn't have the scallops doing the connecting. I really like how it makes for several 'paths' in the work, and then ends in fairly solid peyote at the ends. The clasp is from the Elegant Elements line of findings. For those of you looking for a similar color palette, the original Honeybutter soup mix started off with a bead mix of the same name which is, I think, manufactured by Miyuki, and if you do a Google search, you should be able to find the same basic mix in several sizes of seed beads and firepolish beads as well. I then added a TON of my own stash beads (Swarovski, freshwater pearls, faceted glass, cubic zirconia, triangle/cube/hex/24kt gold plated seed beads, etc etc) into the mix to make it more unique, but you could certainly use their mix as is. With my second bracelet, Compass, I had more of a true adventure, even though I didn't try anything 'new to me' with it, because it truly evolved as I worked with it. I had a fairly plain, been-there-done-that plan in my head as I started, and didn't plan the chains or jump rings or the basic steampunkery feel to the piece. It just happened as I worked, which is what I think freeform is really all about - seeing where it leads you. I used my own custom Chocolate Cherry bead soup mix (which was concocted for a special friend by request) and a Lisa Peters Art focal cab and freshwater pearls for the side 'cabs.' The base idea was to create something with my Atlantis Cuff tutorial frame work. I really like the double clasp, which to me adds some complexity and is visually very cool when worn. The clasps are attached with double jump rings threaded through the gaps left in the peyote work, and then one jump ring is attach to those two, to hang the clasps. The rings for the other side of the clasp are attached the same way. And although it makes it slightly trickier to clasp (you would definitely need help doing it up) it also makes for a very secure connection which is likely to last longer than using thread loops for attachment. 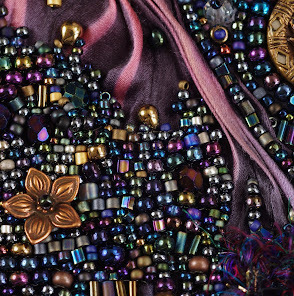 I am usually a bead snob - I admit it. I like to use sterling silver beads and chain or 24kt gold plated beads and findings... but I have lately been smitten with this bronze colored base metal look, and it seems to go really well with the 'chocolate' part of the mix as well as adding a more antique feel to it. And although the metal is very soft, I think that the doubled jump rings do make up for some of that and will hold very well. I love your bracelets!! Can't wait to see the next creation. this is so you :) Wowzerz! I must also bring out my soup and make something...that was a really tasty batch for sure!! Lush and beautiful bracelets, Nancy! You do beautiful freeform. It has an order and sophistication, and at the same time, a sense of abandon and excitement. The density is appealing, not overwhelming or chaotic and your use of color is subtle. Even when you begin with soup someone else provided, you seem to all add the right spices. Ae you this god in the kitchen too? Um yeah, what Marsha, said. She described your work so well! I like how in the first cuff you made several strips- I think that's an effective method so you are less bound by what you have already beaded. I love that your second piece was more of an adventure and the name is Compass! Gorgeous piece, love the mix, and steam-punkery :) Can't wait to see your necklace! Thank you, Mandi!! It's such a fabulous adventure, and I appreciate the chance to participate!! Thank you, Christine!! I've been gone all day, and cannot WAIT to visit all of the blogs myself to comment! Thanks so much for stopping by!! Nancy you truly amaze me with your ability to let it just flow. I am such a fan of freeform but have just not gotten to the point where it will flow like this. You are truly an inspiration to anyone who wants to see where freeform can lead you! ((((( K ))))) Thank you!! :) :) You'll decide when you want to try - and you'll love it when you get there, lady!! Two such wonderful and wonderfully different pieces! Your first, with the honeycomb bead mix focuses entirely on texture while the second is definitely pattern, line and color. I love the subtly steampunk feel to Compass, with the additions of chain and and findings. Thanks for being a part of this challenge! Karen, thank you so very much for hosting this, it was a wonderful chance to dive into something that makes me very happy. I absolutely love your bracelet and am having a ton of fun going around and making new friends!! Thanks so much for your lovely comments!! Wow! Wow!and Wow!! Freeform Supreme. Love it. So glad to meet you!! I find the idea of using 2 strands very interesting. The scallops at the bottom can be a problem. Also I like what you said about the third piece becoming a necklace. I always think to myself when I start a necklace that behind each necklace is a bracelet and actually the length of a bracelet is just right for the front of a neck, I discovered by chance. And many of my bracelet starts do become necklaces. Actually I just love to wear a necklace so that may be why. But I do love to stack my wrist and with a cuff like yours I wouldn't have far to go to having an armful. Your works is wonderful. Thank you SO much, Mary!! I enjoyed seeing you piece, it's fabulous!! I can't wait to see more!! Nancy, like everything you do, those are absolutely stunning. I love how you made separate strands in the first bracelet and wove them together. It is a genius idea. The second bracelet is amazing and the colors are right up my alley. I love the addition of the chain. The way you wove it makes me think of embroidery. I keep staring at the photo wondering how you accomplished it. Thank you, Tanya!! You're so kind!! I used a little bit of embroidery in the second one, for the focal and the freshwater pearls on the side - and then did freeform off of those. :) :) I can't wait to go visit your blog and see yours!! Both are stunning and both so different. I love the colors in both - great job nancy!!!! Nancy, stunning pieces!!! I love everything about them. What a clever idea to make a few freeform pieces and weave them together. Bracelets intimidate me because I can never get the shape right -- I may have to follow your lead! Your work is very inspiring, stunning! Holy moly Nancy!!! I'm just blown away by the gorgeousness of both pieces!!! I love the palettes for both, but the chocolate cherry is to die for (and kinda makes me hungry for dessert!) The embellishments on Compass are just stunning! Every blog I've hopped to I've learned a new trick or tip and so thank you for adding to my knowledge base with the advice about working several strips and then connecting them as you did in Honeycomb. Bravo!!! Nancy! What a couple of jaw-droppers you've got there! I love how you were able to challenge yourself within the challenge, and your idea of linking three freeform strips into a larger piece is genius. And that third piece? You had me at "sugilite"...Can't wait to see what the gypsy will be wearing! Wowsa! You made two bracelets! I am officially jealous. Sugilite? Sunstone? Gypsies? I'm intrigued and I can't wait to see your third piece. Thank you very much, SaraBeth!! I have admired your work for some time and am in awe of these pieces you presented today. I love the idea of connecting several links of free form to create a cuff. The solid chocolate cherry with brass detail is exquisite! I would dearly love to someday do work like that. Thank you so much, Katherine!! I love what you made, and am so glad we 'met' through the hop!! What a beautiful bracelets, I love both of them and can not wait to see the next - your work is amazing! Ok, when I saw honeycomb on fb, I thought that was the only one. Then I get here, and you knocked my socks off with the Compass bracelet! Two completely different looks, but Oh, how I love them both! Honeycomb just has a glow that is mesmerizing. Thanks for sharing about the peyote strips. That's a unique idea that worked wonderfully. I love the rich colors in the Compass bracelet, and the edge towards steampunk works perfectly with the style. Nancy, you are always such an inspiration, and a joy to follow! I am a huge fan of your work Nancy. And I've been "dying" to see your designs for this challenge. What can I say, except that they are absolutely STUNNING! I love your idea of peyote strips. I just have to try it some day. Thank you so much for sharing! Both bracelets are gorgeous and I am in love with the richness and complexity of your bead soups. Your talent never ceases to amaze me! I love your cuffs they are gorgeous! The gold and cream bracelet is so regal! I love that it's wide with fine detail, making it look so intricate! The dark red bracelet is just stunning. The colors and the chains make it look like it's straight out of the Ottoman empire or part of an exotic belly dancer's ensemble! Beautiful and rich! Two utterly different wonderful pieces...and thank you for the "insight" about the multiple lengths of peyote...I think I'll have to try that too. Gorgeous!